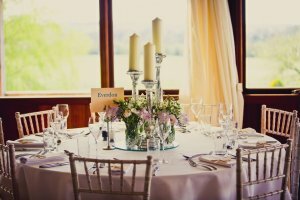 An important step in the wedding planning process is choosing how you would like to arrange the tables for your wedding breakfast.  There are lots of possibilities when it comes to this and you will want to choose a layout that suits not only your venue but also your guest numbers. 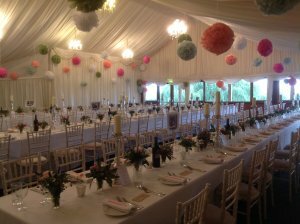 Here at Crockwell we can cater for weddings from twenty guests to one hundred and eighty; smaller parties often in the pretty vaulted hall but we still have great flexibility in the main marquee and this is down to clever table placing. For more details on the sizes of rooms and where they are, see our Floor Plans. 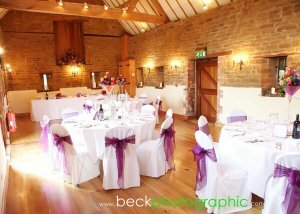 If you are a small wedding party in a large area then it is particularly important to use the space wisely. 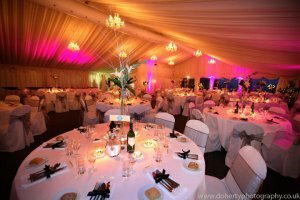 The last thing you want is vast spaces between your tables; your guests will end up feeling isolated and all of the party atmosphere that you expect at a wedding will be lost. There are various solutions to such a problem. One is to make use of our balustrades and urns (below). 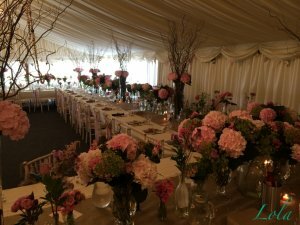 The balustrades serve to frame your top table while the urns look beautiful when filled with flowers or plants with fairy lights. 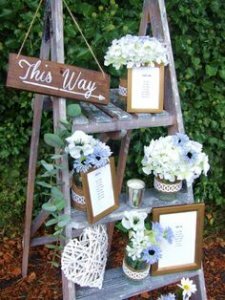 This also creates a walkway behind your top table from the bar to the dance floor. When it comes to the table themselves, there are more options. Most couples opt for round tables with either a long, round or “dogbone” top table. For smaller numbers, it is also possible to have long tables or even to create open squares or rectangles. 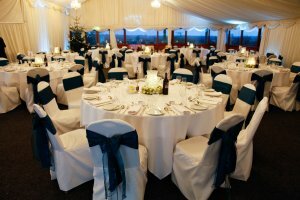 For parties of up to ninety, it makes sense to stick to tables of no more than eight thereby using more tables to fill your space and ensuring that your guests aren’t cramped. 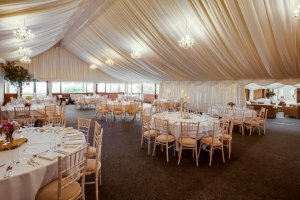 We also have a couple of sets of sofas and armchairs which we use to create “chill out” areas in either the main marquee or bar marquee. 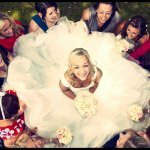 For big wedding parties (120 and over), you will want to use all of the space available. 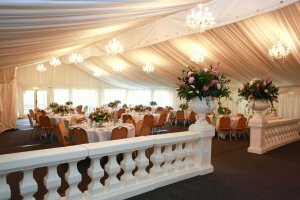 The balustrades can be pushed right to the back of the marquee or arranged to create a stage area for speeches. You may also wish to make use of our larger tables that seat up to twelve guests comfortably. 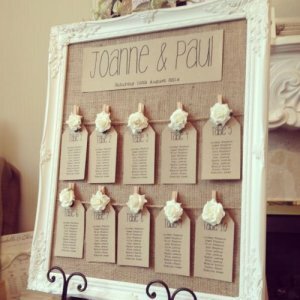 You will need to come up with a formal seating plan for your guests for the wedding breakfast (your first meal as husband and wife). This can be a tricky task so it’s best not left to the last minute. You want your guests to feel comfortable and the conversation to flow. Your top table can be long, round or a dog-bone (below), which can be more sociable for those sitting either end. 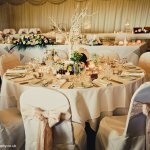 Traditionally, the top table would consist of the bride & groom, both sets of parents as well as the best man and maid of honour however it’s best to do what you are most comfortable with. 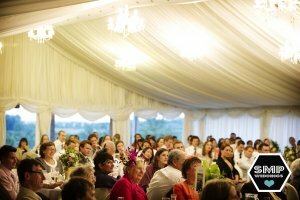 Bear in mind that for the speeches, you don’t want anyone to have their backs to the speaker – so if you opt for a round top table in the centre of the marquee it’s good to have a stage or formal area to one side of the marquee from where to deliver speeches.